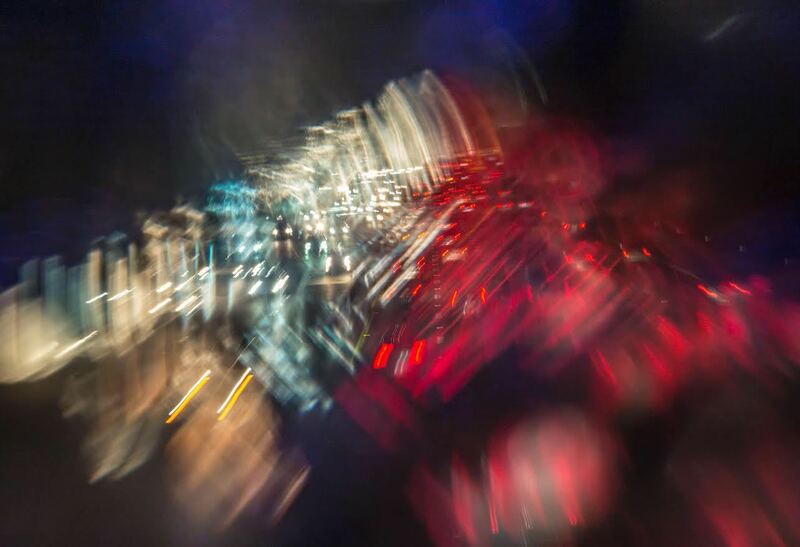 One of the photographs on display at the Canoga Park Youth Arts Center, featuring colorful lights in motion by Teresa Morrison. Photo courtesy of Holly Stuczynski. 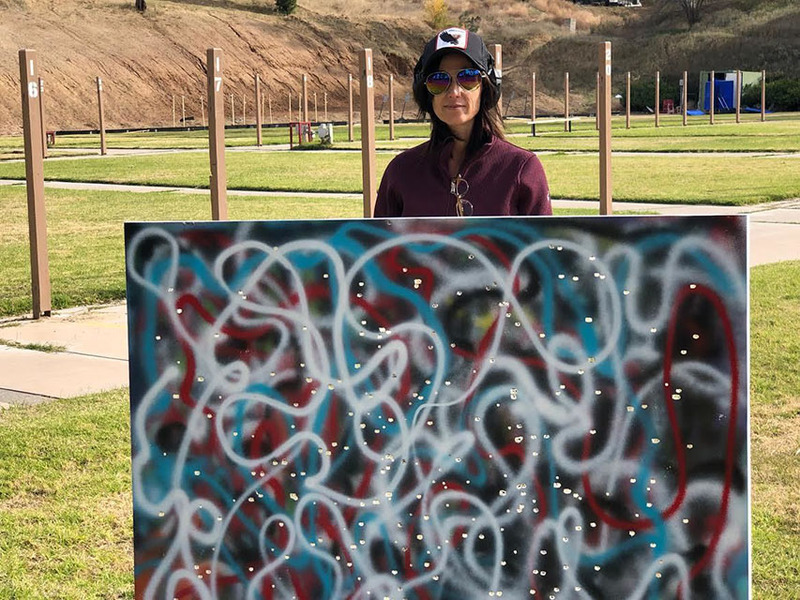 Iris Peretz poses with a piece that is on display now at the Canoga Park Youth Arts Center. Photo courtesy of Holly Stuczynski. A group of ten California State University, Northridge graduate and undergraduate art students explore the theme of human compassion through their art in a free art exhibition on display now at the Canoga Park Youth Arts Center. The notion of applying the principle of this rule to an art show came together organically for Stuczynski via the combination of a dinner table conversation she had with her husband one night discussing karma, and a subsequent chat she had with her classmates soon after about the desire to share their work outside of just the classroom sphere, she said. “I wanted us to stand up for each other in today’s world and to see each other’s work in a space beyond the classroom,” Stuczynski said. The group of students featured in the exhibit are enrolled in a class taught by professor Samantha Fields, Art 429, which focuses on teaching art students how to market themselves. The students learn how to build up their resume and website, network, and stay organized. “Sam Fields is such a wonderful teacher and person. I just feel so privileged to be part of CSUN — it really is the best art department around,” Stuczynski said. The theme of human compassion is the common thread throughout the exhibition. Another student, Iris Peretz interpreted the rule by combining Stuczynski’s and Morrison’s views. Peretz’s art incorporates the concept of tikkun olam (repair of the world), a Jewish precept she defined as “offering acts of kindness in order to repair the world.” Her work in the show “[speaks] to the current events of today and invites viewers to contemplate and collaborate with the work,” she said. The student artists hope the themes will resonate with and inspire people to continue to pass on the baton of kindness to the next person they meet, Stuczynski said. In addition, she said, she hopes community members will continue to support local artists by offering platforms for their work. An opening reception will include a discussion with the artists, from 3 to 5 p.m. on Saturday, Jan. 19, at the Canoga Park Youth Arts Center located at 7222 Rummet Avenue in Canoga Park. The exhibit will be featured until Jan. 25 and will be open to the public Monday through Saturday from 10 a.m. to 5 p.m. The event is free, but donations are encouraged, as the funds will benefit CSUN’s Sculpture Club.